As a pre-teen entering seventh grade Accelerated English, my oldest had his first ever summer assignment. We were actually pretty successful at helping him pace himself with the reading itself as well as the three assignments that went along with the reading and staved off the 11th-hour panic of completing everything before bedtime on Labor Day, the day before school started. It required some frequent reminders and withholding of video game privileges to ensure the requisite number of pages were read each week, but it worked. This time at least. This being my first time as the parent of a middle-schooler, I was a bit surprised at the reading material. The two options for summer reading were both pretty heavy. Red-Scarf Girl by Ji-Li Jiang is an autobiographical story of Chairman Mao's Cultural Revolution and how it affected a twelve-year-old girl's family and future. 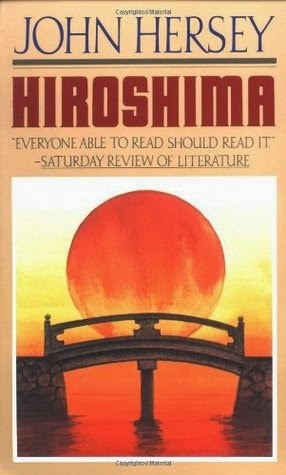 Hiroshima by John Hersey is a non-fiction account of the destruction and havoc wreaked by the first atomic bomb. The book follows a handful of individuals who were in and around Hiroshima on August 6, 1945. They tell of the ordinariness of their mornings, the bright flash of light at 8:15 that signified their world had irrevocably changed, and the horrors that became commonplace afterwards. Gruesome injuries from the initial bombing are described in great detail. The radiation sickness that took lives decades later is not left out either. The effects live on today, almost 70 years later. The matter-of-fact reporting style of the book belies the horror of the eyewitness accounts and the inhuman suffering of civilians: children, doctors, laborers, office workers. It's not an easy read, by any means, but I think it's an important one. I'm definitely glad I read it so I could discuss it with Will as he went along. Thanks to his Research Skills & Geography class, during which they watch CNN Student News almost every day, he's recently discovered an interest in current events. Yesterday, when we were driving in the car, instead of asking me to change the station away from NPR, he even asked me to turn the radio up so he could hear the news better. It wasn't happy news - they were talking about the two police officers shot and killed in Brooklyn - but he was listening and asking intelligent questions and making connections with other events and forming opinions, all vital skills in this day and age. As unpleasant as it is to read about the effects of atomic bombs and the murder of police officers and as understandable as the impulse to avoid unpleasantness is, I think the consequences of ignoring horrors are far worse. So it's time for my pre-teen to become a little more aware of the evils in the world, a little more mature, a little sadder, and a little wiser, too.